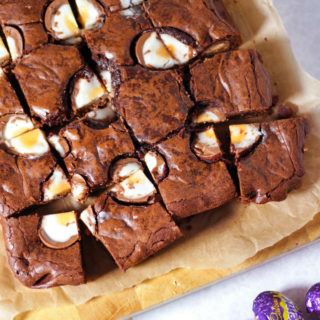 The perfect Easter treat, fudgy gooey chocolate brownies, packed with creme eggs, then topped with more creme eggs, how will you eat yours? Line a baking tray with baking paper (I used a 25x25cm tin). Melt the milk and dark chocolate, butter and sugar together over a low heat. Once they are melted remove from the heat and leave to cool for 5-10 minutes. Pour approx half of the batter in to your tin. Evenly spread the whole mini Creme Eggs over the mixture. Top with the remaining batter, and smooth out with a spatula. Half five Creme Eggs and then spread them evenly over the top of the mixture. (I placed them so that each piece had a part of a Creme Egg on). Bake for 30 minutes, or until the edges are just solid but the middle still has a little wobble. Don't overbake them! Ovens do vary so don't be alarmed if you recipe takes that little bit longer. Brownies are better under-done than over. Enjoy! (There is also half a Creme Egg left over for any testing purposes that may need to take place...).